bottom row: change with VIEW to show additional information such as sunrise/sunset, altitude and battery level. You can use your Suunto Traverse as an alarm clock. Turn the alarm on/off and set the alarm time in the options menu under GENERAL » Time/date » Alarm. When the alarm is switched on, the alarm symbol is shown on most of the displays. Snooze by pressing LIGHT. The alarm stops and restarts every five minutes until you stop it. You can snooze up to 12 times for a total of one hour. Stop by pressing START. The alarm stops and restarts the same time the following day, unless you switch the alarm off in the options menu. When snoozing, the alarm icon blinks in the time display. 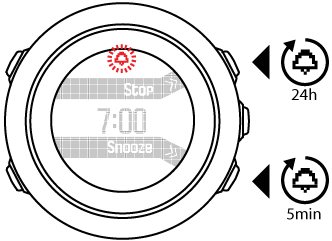 Your Suunto Traverse time can be updated through your mobile phone, computer (Moveslink) or GPS time. If you have paired your watch with the Suunto Movescount App, time and time zone are automatically synced with your mobile phone. When you connect your watch to the computer with the USB cable, Moveslink by default updates your watch time and date according to the computer clock. This feature can be turned off in the Moveslink settings. GPS time corrects the offset between your Suunto Traverse and the GPS time. GPS time checks and corrects the time whenever a GPS fix is found (for example when recording an activity, or saving a POI). GPS time is on by default. You can turn it off in the options menu under GENERAL » Time/date »Time & date. You can adjust the Daylight Saving Time setting in the options menu under GENERAL » Time/date »Time & date.